I built a cover for my trailer to haul the 26 chickens for processing. Sorry about the bad photo. I should have taken a snapshot in daylight. Sorry I haven’t posted in almost two months! 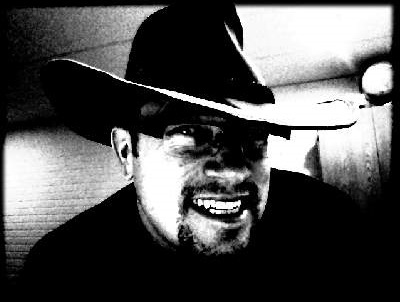 I’m still doing projects in diesel modification and preparedness, but I’ve been slow and I really haven’t written anything in a while. The Job. I found a path away from the military work I was doing and took it. It turned out that this small company had been languishing in an undermanned spiral for some time. So, I show up, try to fix what I can, and wind up working 12-14 hour days all of the time. I’m looking at another opportunity. My boss, a VP of the company, is aware of this. He and some others have made an offer to make it more attractive for me to stay. The other opportunity seems very attractive, though, and I think I’ll still take that when they make the offer. I’m still thinking about it, though. Meanwhile, I got over the hump on getting a quarterly review out, and chose to take today off. I got caught up on a number of things and thought I’d start seeing what I can do to promote my book, again. Here we have 20+ chickens that now occupy my dedicated freezer. The Book. I’d like to announce that my book The Art of Diesel: Building an Efficient Family Hauler will be available for free this coming Friday through Saturday (25-27 July). Go grab a free copy and be sure to write a review of the book on Amazon! Also, if you buy the paperback version, you’ll get the Kindle version for free. Chickens. 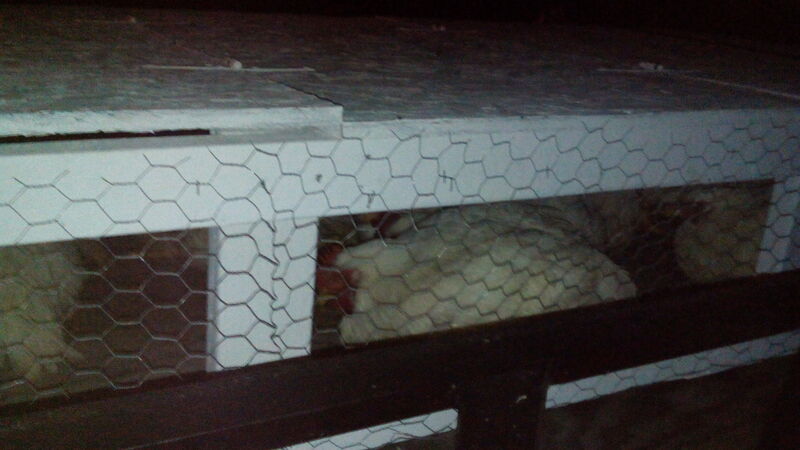 I’ve mentioned that this blog is about preparedness, so I’ll point out that we raised some 26 meat chickens from chicks and after ten weeks they were ready to be “processed.” In fact, these breeds are so pitiful that if you don’t slaughter them right away they’ll start developing all kinds of other problems, including not being able to walk. They are bred to get big fast. We’ll look at some other breeds next time. I didn’t get a good photo of what I did to my trailer, but I built a cover to haul them to the Amish ladies who do the processing at a low price. 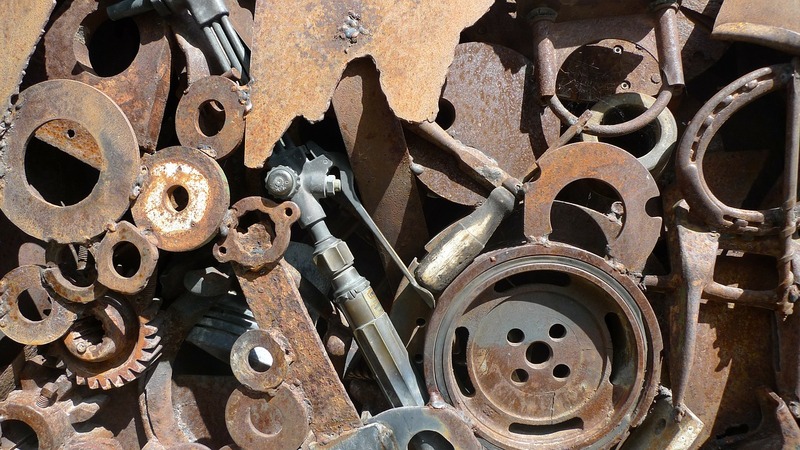 Eventually we want to learn these skill for ourselves, but we don’t want the learning experience to be under the gun with more than 20 to do at a time. We’ll make it a point to set a few aside, next time, and learn. Or, we’ll get with some friends who process their own. So, after ten weeks in a Darby Simpson-style chicken tractor (we only live about two miles from him, by the way), these chickens were ready to go. We dropped them off early in the morning and picked up processed chicken ready for the freezer. 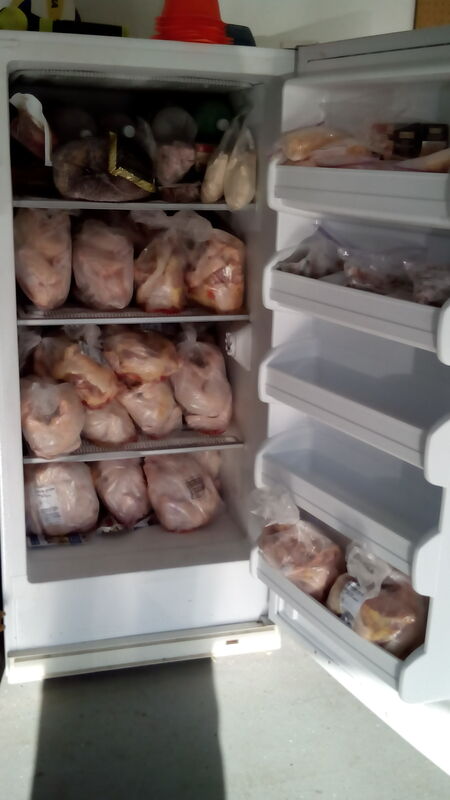 One guy commented that these were some very large chickens, and here’s a snapshot of our freezer stuffed with them. They are very tasty and we feel comfortable about how/where they were raised. Other Projects. I have had to make some repairs and do some maintenance on my Jetta TDI that now has 266,000 miles on it. I’ll take some time to post on that later. 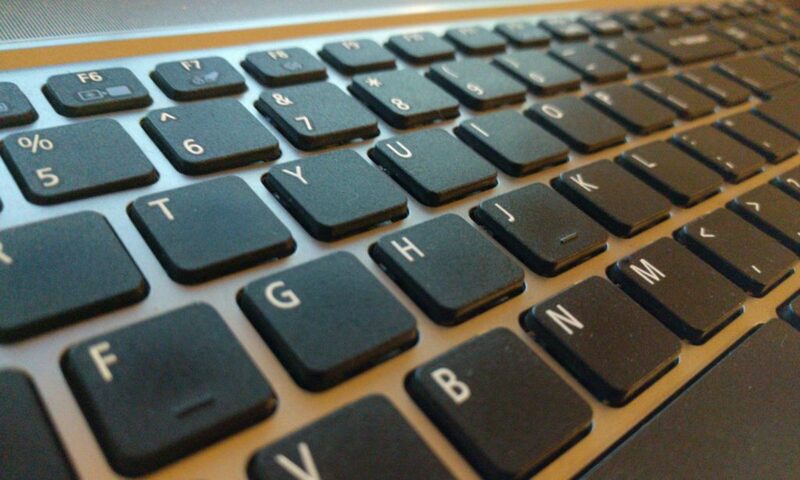 I hope to make regular blog posts on this and the sister site: Core 4 Liberty much more often. –At least I’m starting to blog, again! My Diesel Conversion Book: Now in Paperback! 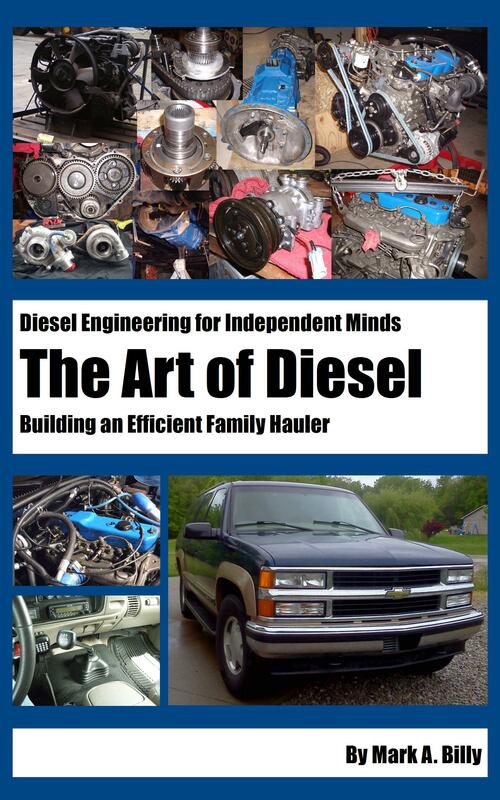 The Art of Diesel: Building an Efficient Family Hauler is now available in paperback format. I know that things have been quiet on this blog. Though I’ve got a backlog of projects and repairs to write about, I’ve been up to my neck in a new job. Yes, I’ve finally escaped the Military Industrial Complex, but I’ve got a lot to learn in my new position. The next few months are likely to be slow with this blog, but I’ve taken photos of what I’ve done and I’ll catch back up later. Meanwhile, however, several have contacted me asking if there was a paperback version of the book. I thought it would be a quick/easy effort, but I found quite a few things that needed to be modified as the book went to a hardcopy format. I finally got it done, though, and now it’s available through Amazon for less than $10 a copy. Please check it out! We are having severe thunderstorms in Indiana, tonight, and it seems like spring is in the air. I think it’s time for another book promotion! Thanks for the reviews, everybody! I just noticed that my Dad recently reviewed the book. I know he’s not exactly an impartial observer, but his review was appreciated. I had a free book promotion several weeks ago, but this time I’m providing some notice, so that you can tell your friends. My e-book will be available for free for the first weekend in March. That will be Saturday the 1st and Sunday the 2nd of March. The US link to the book is here: https://www.amazon.com/dp/B00HMUUOAM, but of course it can be found worldwide on Amazon by searching for The Art of Diesel. Please grab a copy for yourself and pass this along to everybody you know who might be interested! If you’ve read the book (especially if you liked it), please be sure to make your way back to Amazon and review it. Any feedback I receive is greatly appreciated. At present, the book is only available in the Kindle format that Amazon uses, but please note that free Kindle apps are available for almost any platform. Even the latest Android-based Nooks can load a Kindle app to read this book. Monday the 13th: Free Book Promotion! 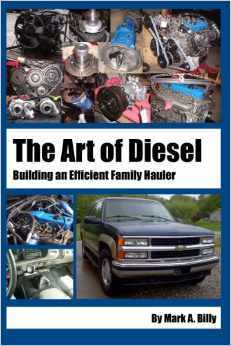 I’ve just set up a promotion on Amazon.com where free copies of my e-book “The Art of Diesel: Building an Efficient Family Hauler” will be available for free for one day only on Monday the 13th of January 2014. The book can be found here: http://www.amazon.com/dp/B00HMUUOAM. If you download and read the book, I encourage you to post a review in Amazon and any other social media outlets you use. My e-book The Art of Diesel: Building an Efficient Family Hauler was uploaded to Amazon’s Kindle Direct Publishing site last night. After a couple iterations of tweaking the format to work better on the Kindle (or on Kindle apps available for Android, IOS, PCs, and Macs), I hit the “publish” button. This morning, I received notification that my book was available online. This is the book on the Suburban’s diesel conversion. -If you buy a copy and read it, please be sure to review it on Amazon! With the change, we’ve updated the theme and will be adding some new features to the site. I’ve ported all of the the old content over to the new version of the site. I’m still working on improvements to the Suburban and other self-reliance projects and will do a better job sharing more on the topic. You may have noticed that my last post was in October. I’ve been concentrating on my book The Art of Diesel: Building an Efficient Family Hauler, that will be available soon as an e-book through Amazon. You can get the Kindle app for your smartphone, tablet, or your PC, if you don’t have a Kindle. If there’s enough interest, I’ll consider creating a print edition, too.